A new software approach of multichannel broadcast playout systems. Serenity Playout Server engine can run on standard hardware or on virtualized environments. Great news for all of you working in playout centers. 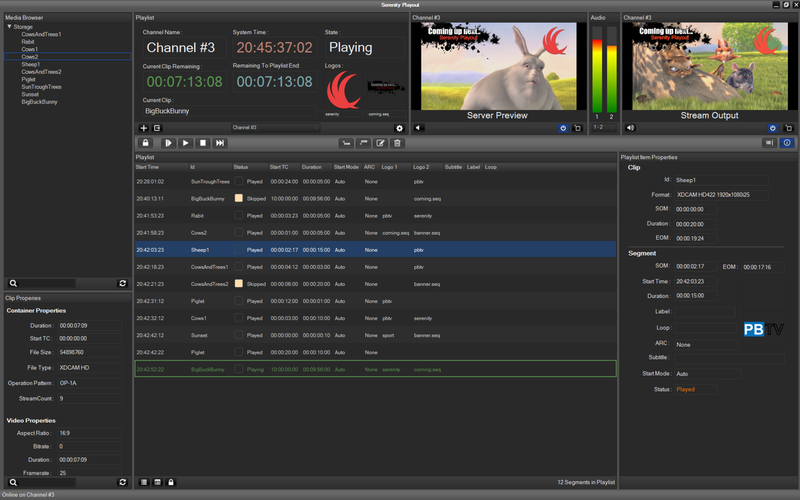 We present the next step in playout software: Serenity is more than just a channel in a box solution. It is virtual, scalable and runs on servers or in the cloud. With Serenity the transition into IP is seamless and smooth. Serenity Playout is designed to run in a virtualized environment. It uses latest virtualization technologies and runs on virtual host servers. By design, one playout channel is served by one virtual guest machine. This makes the system very flexible and very scalable. Serenity’s approach is a software defined broadcast solution with no need for SDI infrastructure. As a result, a complete and fully-featured playout system can be built on regular IT infrastructure. Without SDI signals and cables, the architecture of the playout system will be simple, scalable and very flexible. Although Serenity does not need SDI, the system can have optional SDI input and output ports to be compatible with current systems. Serenity can be used from single channel playout to real cloud playout systems. Adding new channels to a live system is very simple now — a new VM has to be started and configured, then the system is ready to play. Simple system architecture makes the installation simple, in addition, it reduces installation costs. Operation costs can also be saved, because only one system has to be managed instead of many subsystems. The flexibility of Serenity Playout enables to use it from single channel playout to multichannel playout. 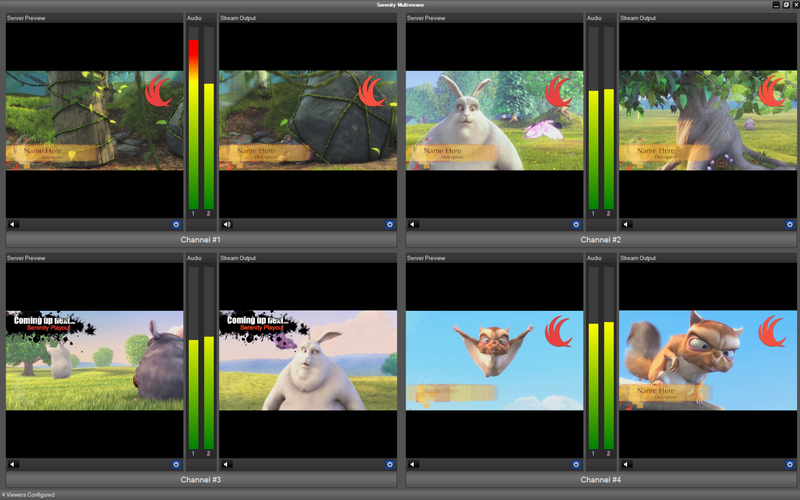 As the name of Multiviewer application suggests, it displays the output of multiple Serenity Playout channels in multichannel playout system. Simple and easy-to-start user interface that does not require any software installation as it uses a standard web browser instead. From the web browser the operator can connect to Serenity Server through Intranet or even through Internet. Serenity Web Client has only basic functionality and it was mainly designed for monitoring and for admin tasks. It works on devices which can run a web browser for example iOS and Android tablets and smart phones.